Breaking News: In January, 2018, Assist. Sec. of Mental Health Dr. Elinore McCance-Katz thankfully disbanded SAMHSA’s registry of so-called evidenced-based programs. Our op-ed in The Hill explains why we support this decision. Dr. Mcance-Katz statement is here. 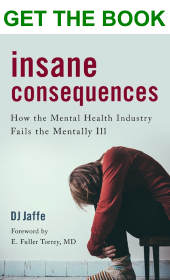 The Substance Abuse and Mental Health Services Administration (SAMHSA) was created by Congress to “reduce the impact of…mental illness on America’s communities.” And Congress directed it “to target … mental health services to the people most in need”. SAMHSA has failed to do either. SAMHSA ignores the 4% of adults with serious mental illness. Instead, SAMHSA focuses on “improving mental wellness” for all Americans. SAMHSA supports and funds groups that don’t believe mental illness exists. SAMHSA certifies programs as being evidence based even when they do not help seriously mentally ill and/or lack evidence. SAMHSA’s 600 person staff only includes one medical doctor specializing in mental illness. SAMHSA encourages states to spend a portion of their $2 billion in block grants on preventing mental illness when we do not know how to prevent mental illness. SAMHSA wastes money on make-work projects and useless publications. SAMHSA’s Protection and Advocacy for Individuals with Mental Illness program (PAIMI/P&A) lobbies to get mentally ill who need hospital care out of hospitals and treatment. SAMHSA refuses to support evidence based programs that do reduce violence, incarceration, hospitalization and homelessness like Assisted Outpatient Treatment and hospitals. Congress passed The 21st Century Cures Act creating an Assistant Secretary of Mental Health to oversee SAMHSA. The President should appoint a doctor who wants to focus SAMHSA on serious mental illness or someone from law enforcement like a judge, sheriff or police chief to that position. NIMH had similar mission-creep problems prior to the arrival of Dr. Thomas Insel, but he was able to refocus the agency back to serious mental illness. If that doesn’t work, Congress should consider eliminating the agency and placing any mental illness programs worth preserving within other agencies with greater dedication to improving the lives of people with serious mental illness. Ex. NIMH, CDC, DOJ, NIDA, etc. SAMHSA does not require programs to be ‘evidence-based’ or to help people with serious mental illness. Less than five are for serious mental illness. SAMHSA only measures soft outcomes (‘satisfaction’, ‘feeling of wellness’, ’empowerment’), not meaningful outcomes (reducing violence, arrest, incarceration, suicide, homelessness and hospitalization). Because states rely on SAMHSA certifications, they are funding programs that lack of evidence. WRAP (Wellness Recovery Action Plan) claims to improve wellness. But SAMHSA relied on studies by those who sell the program. Teen Screen There is no evidence it reduces suicides, but as a result of SAMHSA certification, it is used in 47 states. Kognito At-Risk for College Students claims to help students identify and refer students in ‘psychological distress.’ There is no evidence it works. Mental Health First Aid (MHFA) claims to teach people to identify individuals so asymptomatic, others can not identify them. The program makes those trained feel better, but there is no evidence it helps people with mental illness. Following are some programs with good results that SAMHSA resists certifying. Assisted Outpatient Treatment has had stellar results in helping people with serious mental illness avoid homelessness, violence, arrest, incarceration and hospitalization. DOJ certified AOT as an effective crime prevention program and so has AHRQ. There were numerous attempts by families of people with mental illness to bring AOT to SAMHSA’s attention and SAMHSA’s own stakeholders voted for SAMHSA to evaluate AOT. They ignored it until pressure was too much, and then immediately put it in the bin of ‘legacy’ (old) programs so it would not show up on their website. Congress forced SAMHSA to give AOT grants for it as part of the “DocFix” bill and 21st Century Cures Act. SAMHSA hasn’t certified Mental Health Courts as an evidence based program. Mental health courts help the seriously ill avoid incarceration. SAMHSA hasn’t certify Crisis Intervention Training (CIT) for police as an evidence based program. CIT Training helps people with serious mental illness avoid arrest or injury in altercations with law enforcement. The House Subcommittee on Oversight and Investigations of the House Energy and Commerce Committee held hearings on SAMHSA. “SAMHSA’s strategic plan entitled “Leading Change” focuses exclusively on “behavioral” and “emotional” health and doesn’t mention schizophrenia or bipolar disorder. SAMHSA funds groups working to ensure people with serious mental illness do not receive treatment until after they become danger to self or others. SAMHSA won’t exercise oversight of Protection and Advocacy Program. PAIMI lawyers got Joe and Amy Bruce’s son Willy released from the hospital over their objection. Two months later Willy killed Amy with a hatchet. SAMHSA spent over a year creating a 1,000 word definition of “recovery” rather than using the three word dictionary definition (‘return to health). SAMHSA created an extensive make-work process to define “trauma” rather than using a dictionary. SAMHSA wastes money publishing children’s books including A Day in the Park, brochures on Making and Keeping Friends and Building Self-esteem, marketing stickers saying, “I am cool” and “I listen well,” acquiring art-work, producing plays, and creating video games. SAMHSA distributes $500 million in mental health block grants to the states and insists states spend some on prevention in spite of the fact there is no known way to prevent serious mental illnesses. Mental Health First Aid (MHFA) Liked by Trainers & Trained, but Does NOT Help Mentally Ill.